A hare is slaughtered, and later an unfortunate death occurs where the hare was buried. In one remarkable chapter we travel with Cathy and Rob to the infirmary where their father languishes – it’s a tale so filled with layers of emotional truth that I almost craved for it to be a lone short story, so perfect and self-contained and complete did it seem.Single sentences glow from the page with glorious clarity, and a warmth shines through, making me care for each of the characters, even grumpy grandfather and irritating Miss Gallagher, whose adoration of Cathy is as worrying as the narrator’s intense relationship with her own brother. One by one, Cathy’s companions abandon her to the spell of winter, until she is reunited with the one person she longs for most. The description of the wild countryside surrounding Cathy’s increasingly dilapidated home brings a raw beauty to the novel, making reading it like passing through a landscape of forests, fields and barely glimpsed animals, with Cathy seeming like just another of the evasive creatures hiding among the trees. Despite the difficult subjects to tackles, this is an absolute pleasure to read – the kind of novel you can get lost in for entire afternoons and yearn to return to at the end of the day. The novel is set around the time of World War One but seems ageless, timeless. A perfect, contemplative winter read. A Spell of Winter by Helen Dunmore is published by Penguin and available to buy from Amazon. 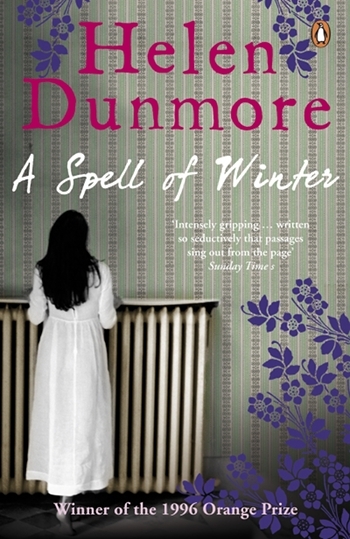 This entry was posted in Reviews and tagged A Spell of Winter, Book reviews, Helen Dunmore by Judy. Bookmark the permalink.